By changing the way AI characters interact with Shepard, BioWare hopes to disprove the idea that players can't enjoy a sequel without playing its predecessors. Mass Effect 3 is positioned to become one of the biggest titles of 2012, but as the story grows, so does the problem of attracting newcomers to the series. Not only will the third installment be a direct continuation of an epic narrative, but throw in decision-based story elements and over sixty hours of past exposition and things start to really get tricky. Yes, most people who pick up ME:3 will have likely played the other two, but BioWare is determined to make it just as easy for those who have never stepped inside Commander Shepard's armored N7 boots to enjoy the game as those who have. "In all honesty, we didn't do a really good job of new player orientation [in Mass Effect 2]," said BioWare marketing man Nick Clifford. "If you didn't play the first game, then 2 was pretty jarring for the first half hour." But that mistake is exactly what the development team is trying to avoid this time around, as they focus on making the third game's experience "pick up from the get go." The first step in accomplishing that feat is programming the AI to interact with players differently depending on whether or not they imported a save from Mass Effect 2. If they did, the characters surrounding them will be much less likely to dump narrative exposition on them during the game, while if they're new, NPCs will drop in more details so the newbies don't feel left out. "If I'm a new player and some guy walks up to me and is like 'Ohhhh, Shepard! Remember that one time?' I would be like 'No. I don't remember that one time,'" Clifford said. "So we wanted to make sure that there aren't those moments that the player is like, 'Who is this? What's going on? What are they talking about?'" 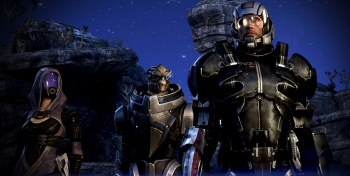 The PlayStation 3 version of Mass Effect 2 included an interactive comic book meant to help players understand the events of the first game but, this time around, BioWare will be adding what Clifford calls a "story so far narrative" within the game itself. It sounds like new players will have a much easier time dropping into the world of Mass Effect this time, but with Mass Effect 3 not arriving until March 6th, there's still time to just go back and play the first two before diving headfirst into the series' conclusion if you don't want to risk it.